One of the most critical aspects of building a food storage is to store foods that can be used in meals that your family will eat. We always like to say “If I could just eat PIZZA in an emergency, everything will be ok”. The bread part of the pizza is easy with food storage ingredients, and when we discovered that freeze-dried cheese actually works we knew it would become a staple in our storage. What is Freeze Dried Cheese? 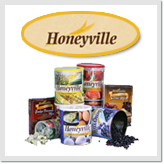 Freeze dried cheese goes through the same flash freezing process that freeze dried fruits and vegetables go through. First the cheese is frozen, then it is placed under vacuum. This enables the frozen liquid in the product to vaporize without passing through the liquid phase, a process known as sublimation. Heat is applied to the frozen product to accelerate sublimation. Low-temperature condenser plates remove the vaporized liquid from the vacuum chamber by converting it back to a solid. This completes the separation process. You are then left with a cheese product you can use like regular shredded cheese after you rehydrate it. What Varieties Does Freeze Dried Cheese Come in? How Do I Reconstitute Freeze-Dried Cheese? There are two methods for reconstituting your cheese. One turns out just like regular cheese, but takes a little longer to prepare. The other is just fine if you are going to be melting your cheese anyway, and it’s quick and easy. 1. 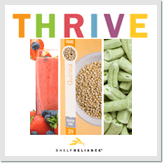 Place 2 cups of THRIVE cheese in a glass bowl. 2. With a spoon, lightly stir cheese while drizzling 1/2 cup of cold water over the cheese. Stir continuously until all the water is incorporated into the cheese. 1. Place a thick layer of paper towels on a plate. 2. Pour dried cheese onto the paper towels. 3. Spray the cheese with a spray bottle and stir around with your finger. 4. Continue spraying and waiting a little bit, spraying and waiting. 5. Once water starts to pool under the paper towel, it should be pretty well hydrated. It may be slightly crunchy but should work fine in recipes for melting, etc. Is Freeze-Dried Cheese More Expensive than Fresh? Freeze-Dried Cheese is a fairly expensive product compared to it’s fresh equivalent. We usually recommend that you try a few of your favorite recipes to make sure that you are comfortable with using it, but don’t necessarily plan to replace your fresh cheese with it on a regular basis. What Are Some Recipes I Can Try? Where Can I Buy Freeze-Dried Cheese? 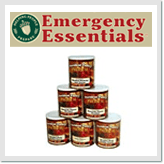 Here are links to three of our favorite sources for all food storage items including sour cream powder!